Natrunsfar: Santa To The Sea Race Recap! 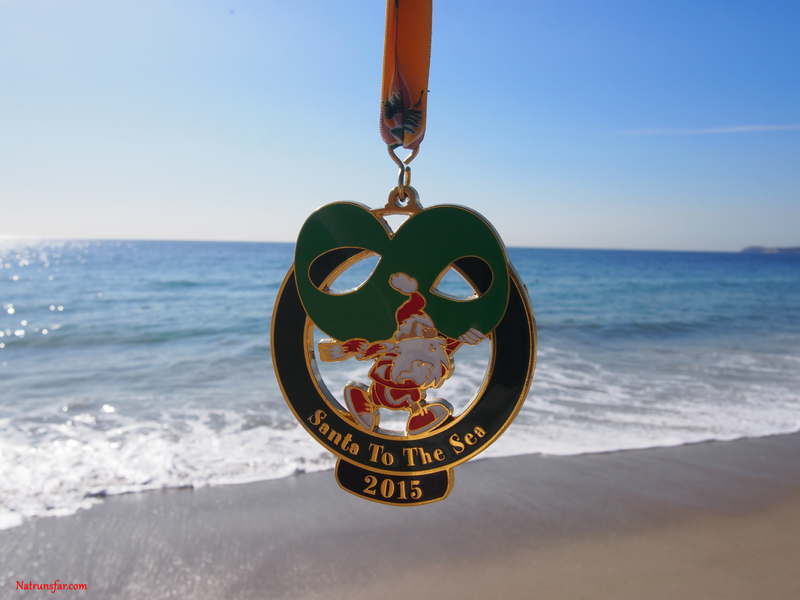 Santa To The Sea Race Recap! Depending on when you read this, there are 10 or 11 more days till Christmas!!! Holy moly this month is flying by and I still have a lot left to do. So, I ran a half marathon on Sunday. Originally, I wasn't planning on running another race after Las Vegas. 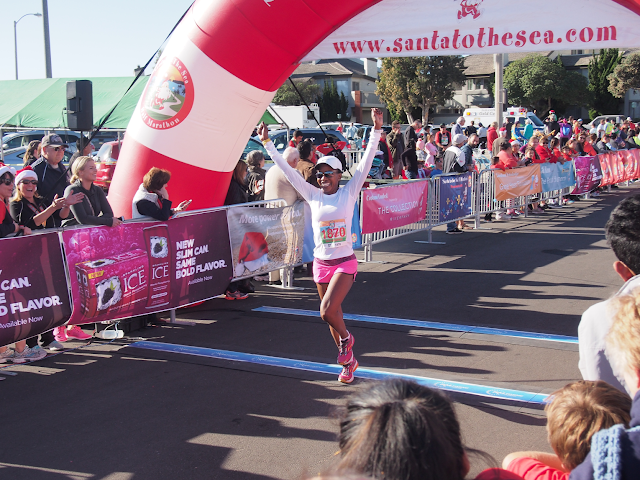 But I felt like my running was continuing to go well and I have heard nothing but awesome things about this race! 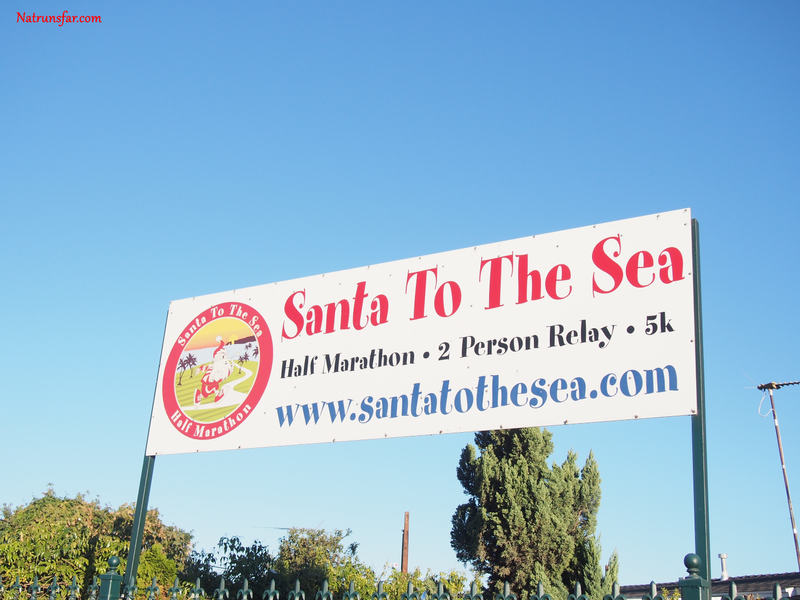 The race is called Santa To The Sea and it is in Oxnard - about 40 miles north of LA. I am digging the medal and the view! My plan was to wake up at 4:30 am, eat breakfast and leave the house by 5:30 am. The race started at 8 am, but you had to take a short shuttle ride to the starting line with the last bus leaving at 7:15 am. It can be hard to sleep the night before a race, but I had an especially hard time sleeping the night before. I finally went to sleep and somehow ---> my alarm didn't go off!! I know, right?! I checked it 3 times before I went to bed and it was set. I think what happened is the ringer (this is my cell phone alarm) wasn't turned on and so, of course I didn't hear it. I wake up and it is 5:30 am!! Noooo!! I quickly get out of bed and eat a slice of toast with almond butter and a banana + a glass of water with Nuun (strawberry lemonade flavor) and throw on my clothes. Jerold and I left the house just after 6 am. We had plenty of time and there was zero traffic and we were able to take the Pacific Coast Highway all the way into Oxnard. He had been traveling all week, so it was really nice to have time in the car together to catch up. We saw an amazing sunrise and I was feeling pretty relaxed. 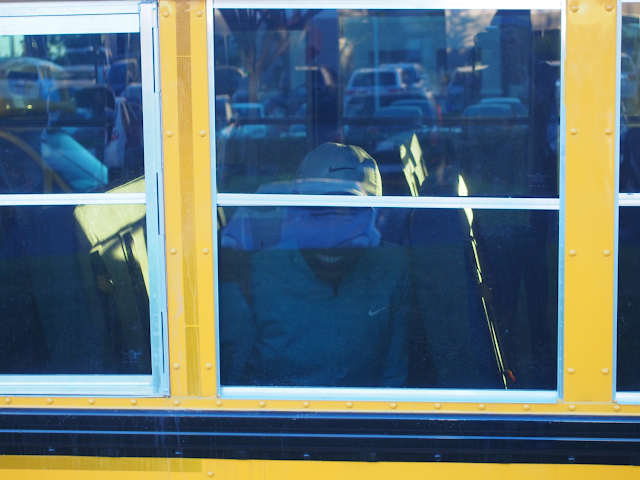 We parted ways, as I was getting on the bus to go the start at this point. Laughing as I write this ---> I still look sleepy in this pic! Off to the starting line!! The course is a point to point course. It's flat (there are two itty bitty hills - one in the first mile and one later in the race over a freeway.) and very fast. 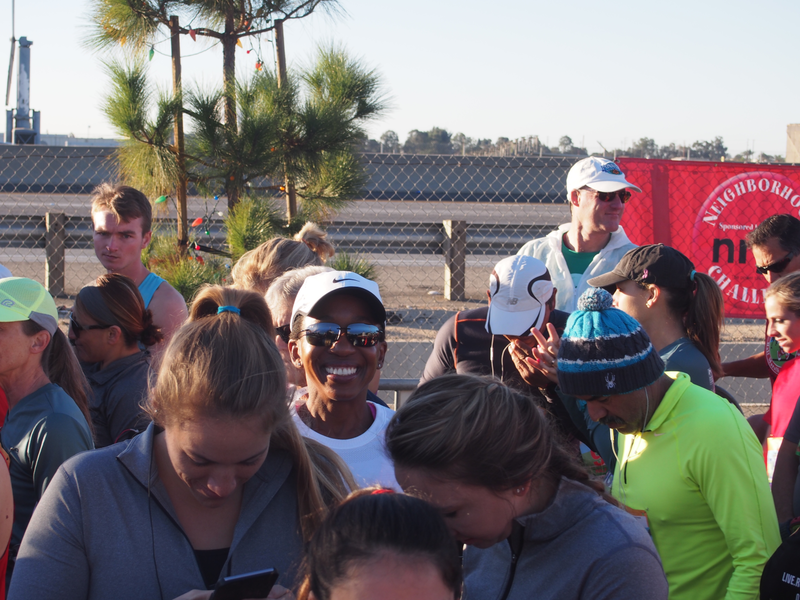 There were several runners racing to grab a spot in the Olympic Trials, so it was very exciting!! The sun came out in full force and it was a gorgeous morning for racing - sunny, but still crisp and cool. There was no way I was driving an hour to go to the expo the day before, so for $20, they allowed runners to pick up their bibs the morning of the race. The race is $95 and then add $20 on top of that (but I did get a coupon for 20% off - yay!) and it's expensive, but I figured I would have spent more in gas and time - which I didn't have - to pick up the day before, It was $20 well spent! By the time I went to the bathroom again (I guess I didn't avoid the porta potty after all), picked up my bib, checked my clothes into gear check - thank goodness they had a great gear check sponsored by UPS, because I did not have throw away clothes - it was time to warm up. My coach instructed me to do a 4 - 5 minute jog with a little sprint at the end to get my engine revved (I love that!). By that time it was time for the National Anthem and ready to race! I felt different for this race vs. Las Vegas. For Vegas, I didn't know what to expect. I hadn't raced in so long I had almost forgotten what it felt like. 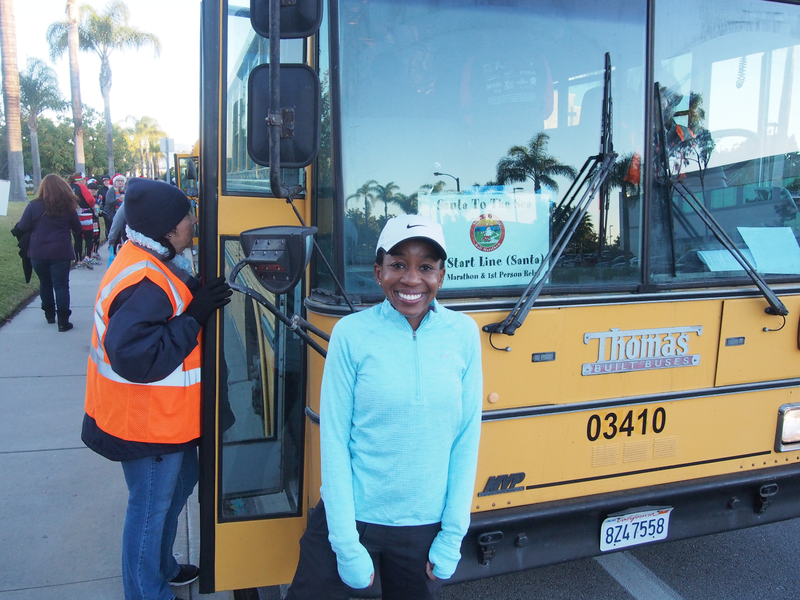 I was super relaxed about it and I remember the first mile in Vegas just rolling along not wanting to start too quickly, not sure what pace I could sustain. My first mile was over 9 minutes! For this race, I was more focused. I felt confident that I could sustain a mid to late 7 minute pace and as I was walking to my corral I said "I know I can break 1:40 in this race." It was a tiny bit scary to say that, as racing is still new to me - I mean before Vegas, I had raced ZERO times in 2015. This entire year, I hadn't run at all until the end of August! It felt a little crazy to say that to myself, but I went with it. I have to have sunglasses on during a race - although I am carefully searching for a new pair. I also knew my first mile would be faster than Vegas - no messing around here, let's focus on the goal, but still keep it controlled. PS: Loving the Brooks Ghost 7 so much. I bought a fresh pair and broke them in this week. These shoes were ready to go and will definitely be my shoe for Boston. Let's get this done. Controlled, focused, confident. I was also wearing my Be Brave, Be Strong, Be You (Tina's slogan - I love it!!) wrap from Momentum Jewelry. The first 5 miles were under 7:30 and I was happy with that. 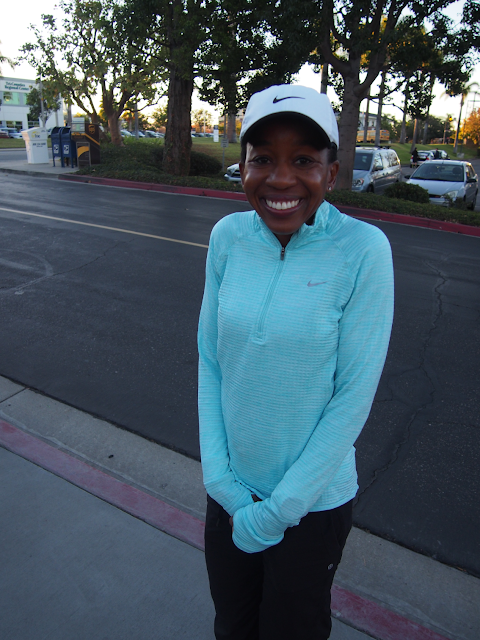 I felt comfortable and the pace felt doable. Let me say (I think I have talked about this before), I DO NOT run this pace on my runs during the week, except for my tempo/speed workouts on Wednesdays. This may change during the core Boston training phase, but for now I run really easy during the week. I have been so careful these past 3 months about easing into training and not doing too much too soon. Okay, so back to the race. Miles 6 and 7, slowed to 7:30 and something clicked during mile 8 (this was the mile I also took a GU - my favorite espresso with major caffeine for a jolt, as I don't drink coffee) and I was able to get it back to 7:26. Mile 9 back to 7:30, 10 was okay at 7:33, but knew I was in danger of slowing down. So this is where lack of fitness comes into play. 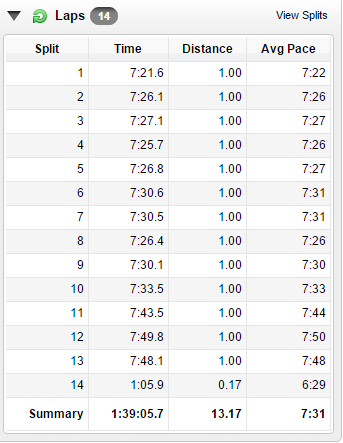 I haven't been running over 10 miles on the weekend long runs, so I definitely felt the struggle during miles 11-13. There was that feeling again of you know you are working hard, but the pace isn't reflecting it. I was still very aware of what was going on and mentally kept thinking "You can do this. You will not give up, you will push till the end." 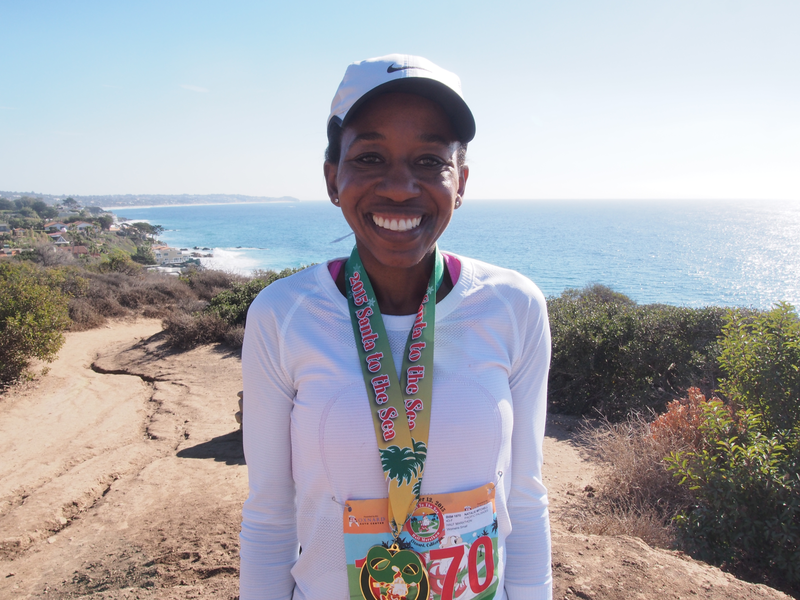 I remember around mile 11, two girls came out of nowhere, guns blazing and passed me - hard. Anyway, the last couple of miles seemed a tad endless - I didn't know the course so I couldn't visualize the finish line, but I knew it was coming. We were at the beach at this point and it was so beautiful. 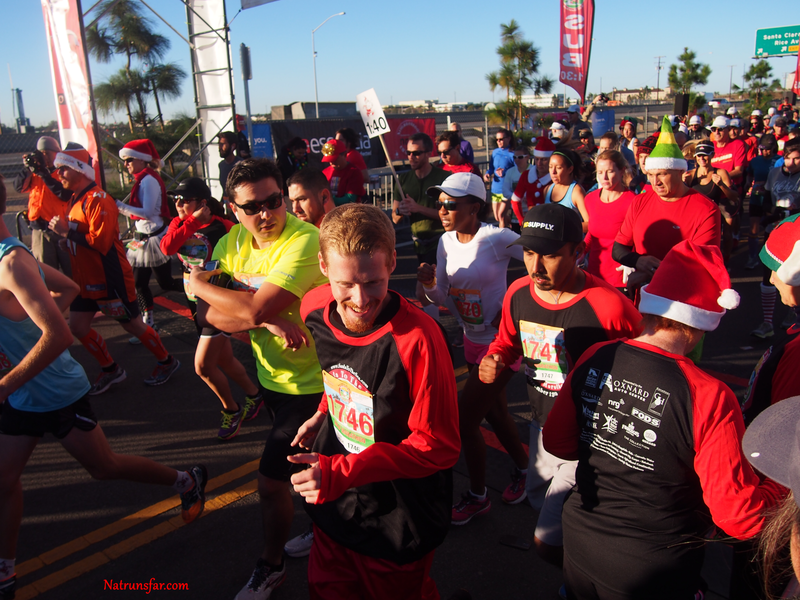 If you are in So Cal or visiting in December - run this race!! So fun, so pretty. Finally I know it's time to sprint and I am ready - I told myself before the race that I would finish strong and I did. I sprinted home with a 6:29 pace and I was happy with that. I did it!! 2nd race post surgery!! Official finish time = 1:39:03! 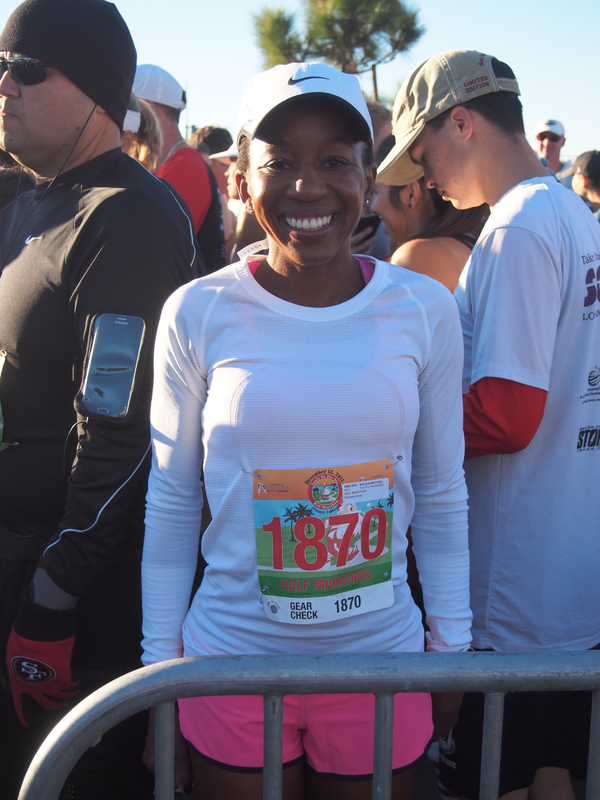 15th woman overall (Out of 902 women). I was pretty stoked with getting within the top 20! This is such a nice way to ease into my training for Boston. My goals are to stay healthy, work harder on my strength training, get more sleep and continue to build and put the pieces of the puzzle together. I know I have a lot of hard work in front of me if I want to grab my goals for Boston. I am not afraid of hard work. My Mom always told me ---> if you want it bad enough, you gotta work for it. Well organized. 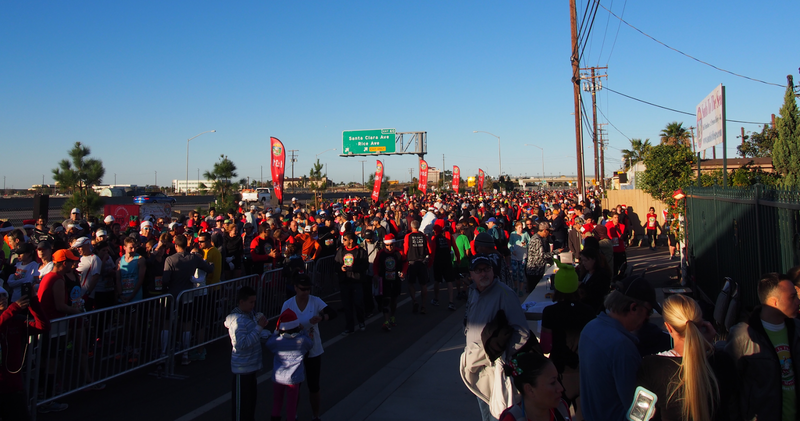 Easy to get to the corrals, plenty of porta potties. Water and Gatorade about every other mile (I took water starting at mile 3 and then every 3 miles or so. Gu at mile 8. I usually don't take any water or fluid the last 2 miles). Some fun bands playing Christmas music and other upbeat music along the way. At one point there was a huge Mariachi band with adorable kids cheering us on. It was so awesome! There are definitely some stretches where there are zero spectators and no music, so you have to work hard and focus on those spots. Great volunteers, really nice people. 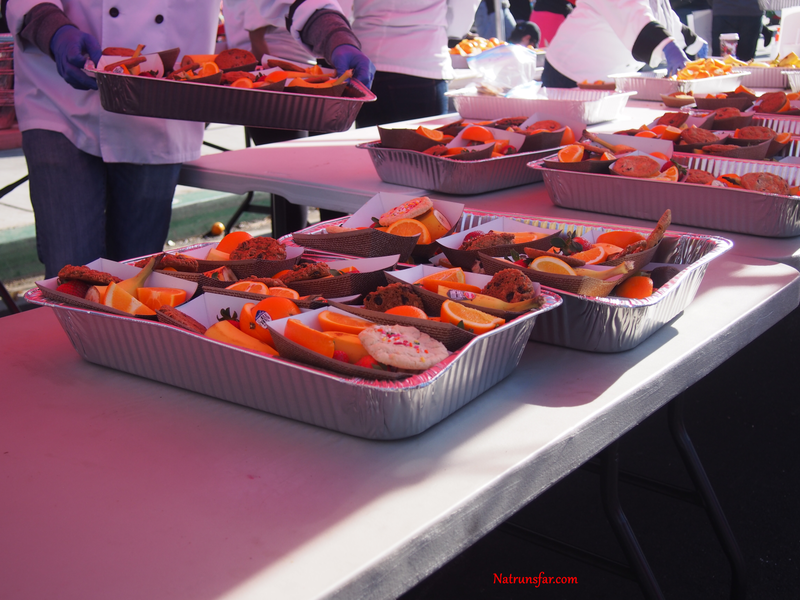 After the race, they provided water, and good snacks. Bananas, oranges, beautiful strawberries (they grow them in abundance in Oxnard), cookies (I can't eat cookies after a race - but so nice anyway!). I ate a banana, 2 orange slices, 2 strawberries and lots of water. The medals are really cool as well as the t-shirt! They had a big tent with lots of vendors to visit and a massage chair with free massages. I didn't wait because we had to get home to our kids. But I did go for a massage the day before the race. I tried it before Vegas and it was heaven. This really works for me - I felt loose and ready to run. I will definitely run this race again, I had a blast. 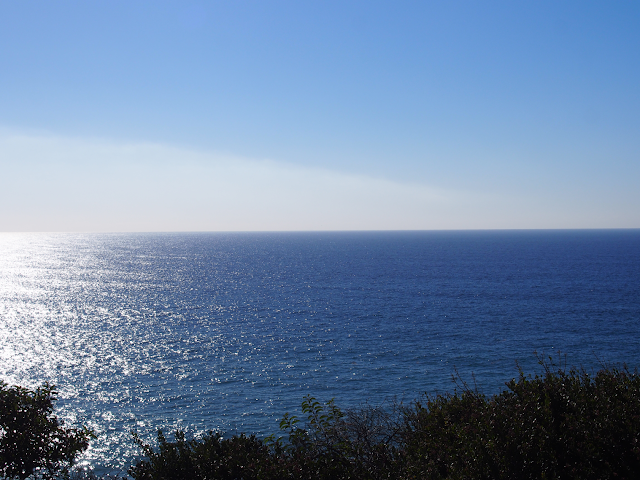 We also took a quick pit stop at one of my favorite beaches in Malibu - El Matador State Beach. Tired, sweaty and ready for a nap. But happy! 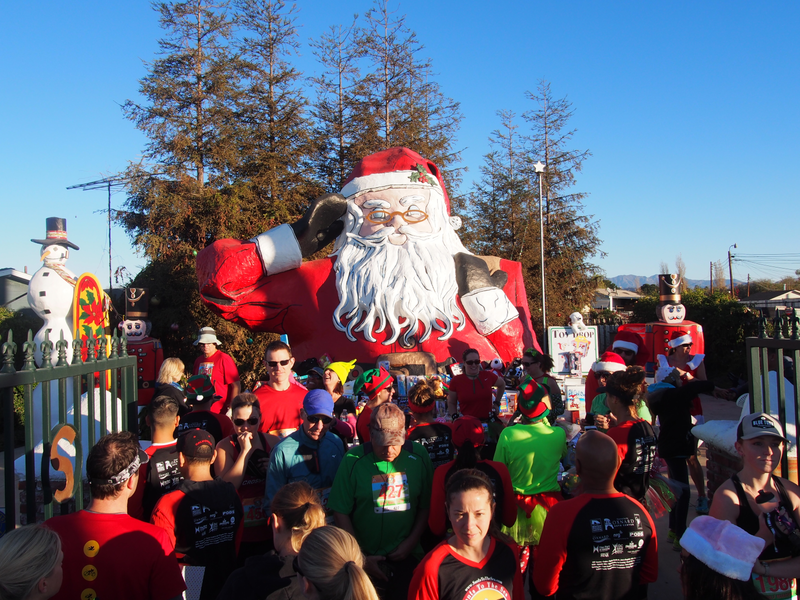 Is there a fun December race that you like to run? What are your New Year's Eve plans? !